Earlier today, Ivanka Majic tweeted a link to the map of where Ubuntu Servers are being used around the world and I thought that was pretty cool so I wanted to find out a little more about how this information was gathered. 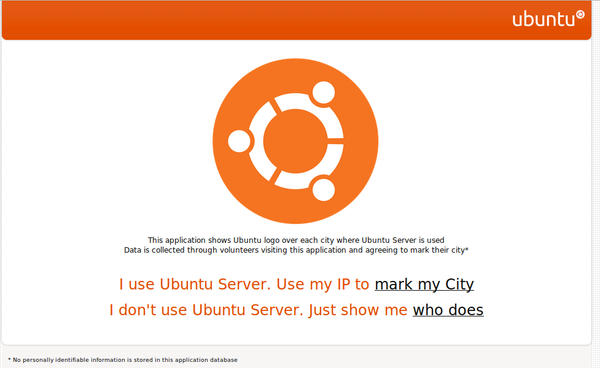 According to the website, the application shows Ubuntu logo over each city where Ubuntu Server is used and the data is collected through volunteers who visit the application and agree to add their city to the map. Also stated on the site is the fact that personally identifying information is stored in the application database. Those who visit the application website can choose to add their information using their IP address or just see where Ubuntu Server is already being used. Sorry, but when I clicked to use my IP it's located my ISP, which is at the other end of the country - perhaps the system could allow you to put in your postcode to locate you or something like that instead of IP address ? Funny thing is Ubuntu's Montreal Canada Office doesn't show up, So does this mean they themselves did not think this to be a good idea. Cool but worthless in some ways. My server doesn't show up on the map. And both http://maps.ubuntu.com/hit/ and http://maps.ubuntu.com/map/ takes you to the map. I'm confused as to any motivation people would have to use Ubuntu on the server vs going straight to the source and use Debian. Desktop Ubuntu owns but on the server? I don't see the point, at all. I run about 20 Ubuntu Servers behind a single public IP. As I viewed the map for my state, it was clear that *under count* is a huge issue. I let the app grab my IP, but it didn't get displayed over my GeoIP location. The closest city is 10 miles away and isn't showing any icons. I thought Ubuntu had a way to count instances using NTP requests. I know that won't work for my, since the first thing I do is point all servers to a local time server which gets synchronized from a local university clock. Servers, desktops, laptops are different computers. This map is counting desktop/laptop users, not servers. Adding a direkt link to the page which starts counting is stupid/worthless. Either make it a POST request or do some other stuff to secure it.